Guild House is the place, where all members need to work together to improve the guild and themselves. Here is an article about everything you need to know about the Guild system. Activity is the most important thing in donate. Since the costs of individual donations are not excessive, they should be available to most guild members, but in order to quickly level the guild, it is very important that as many members as possible make a donate every day. Rewards for leveling up the guild are sent to the guild leader. There are 15 levels of Research, each of them increases the stats of each guild member by a certain %. Further levels of research require a higher guild level. It’s important to know that all items and currencies spent on donate and tribute are not refundable. You can not get them back in any way. 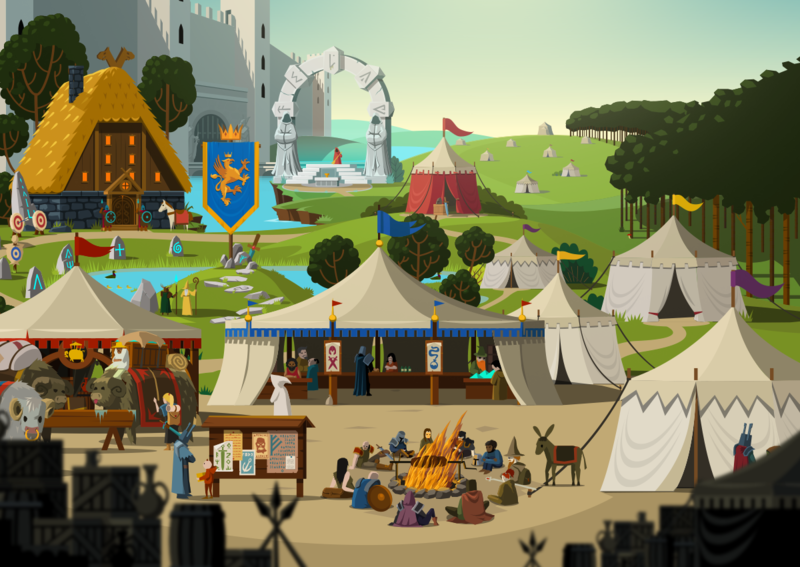 On the guild screen you will also find a tent in which you will learn how much fame your character has. Fame can be acquired by making donate. It is a statistic that remains unchanged even after leaving the guild, it’s a reward for your activity, which is permanently assigned to your character. It will be used in future game modes. Guild Gifts are special gifts that you receive and that can be sent to other members of your guild, you can not open them. To send a guild gift, go to the Guild Center, then find the “Send Gifts” button, choose “Send” and click the “Add gift” box next to the person you want to send it to. You can tap this field more than once to send more than one gift. After doing this, select the “Send” button. The person you have selected will receive a message by mail, in which is the content of the snet gift. Guild Gifts will play a major role in future events and craft. We plan to introduce new types of gifts. The Guild Master can receive guild gifts for leveling the guild. He can distribute them later to members according to their contribution. Guild development values may slightly change over time. We hope you will like the new features. Enjoy! / Have fun! Go to Home > City > Guild > Guild Center > Manage Button > Leave Guild. If you have any other questions, please use the in-game support by going to More > Support > and clicking on the chat box on the upper right-hand side of the screen. Hope this helps. Thank you for playing Questland! can you please update the table with the stats % increment in relation to guild levels? The blog is still a work-in-progress and some articles are being re-made. This article is currently in the “Categorized” section, meaning it’s not complete or updated yet. In the future, we will have a new Guild article! There are a lot of different forms of guild recruiting. You can PM players in the Arena that are similar Hero Power to what you’re looking for. You can join the Discord server and make a recruitment post in the appropriate channel. You can also post in the official reddit thread for Guild recruitment. There is no “right way” to gain members. You must be creative and work hard! We hope this answers your question! It is not possible to send weapons and armor as gifts at the moment. The only armor that can be gifted is the special event-item that is craftable every week. Hope this answers your question!